The pressure transducer of the OMEGA’s PX309 uses two state-of-the-art silicon technologies. Pressure ranges below 100 psi use a high-accuracy silicon sensor protected by a fluid filled stainless steel diaphragm. Ranges 100 psi and above use high-accuracy silicon strain gauges molecularly bonded to the stainless steel diaphragm. Both systems provide a rugged sensor with high accuracy and excellent long term stability. Cable Model PX309 is featured in the Place Order Table below. To order other models see the "Part Number Builder" below the "Place Order" table. 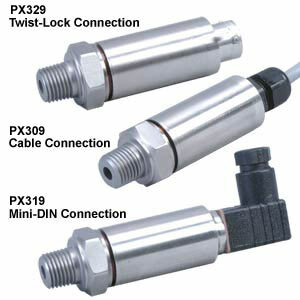 PX309-MA for 4 to 20 mA output models.